Cook and drain orzo as directed on package. Meanwhile, in 12-inch nonstick skillet, heat oil over medium-high heat. Cook onion and celery in oil 3 to 5 minutes, stirring frequently, until vegetables begin to soften. Add bell peppers; cook 2 to 3 minutes. Add garlic; cook 30 seconds or until fragrant. Stir in tomatoes and Cajun seasoning. Heat to boiling. Add shrimp. 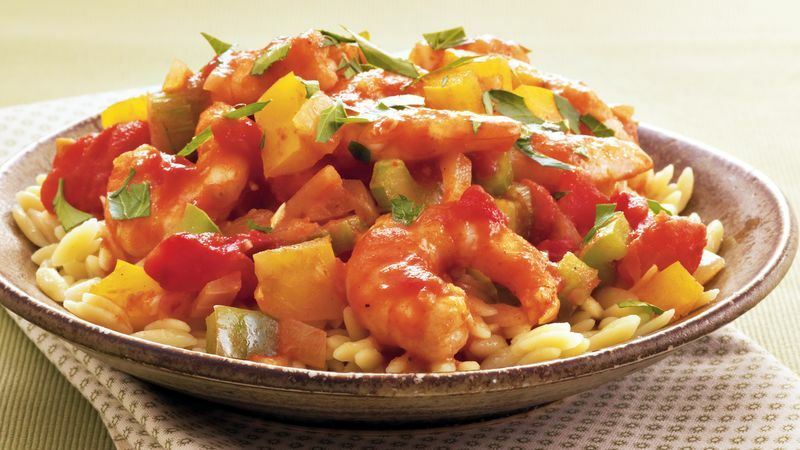 Cook and stir over medium-high heat until shrimp are pink and vegetables are crisp-tender. To serve, spoon 3/4 cup orzo into each of 4 shallow bowls; top each with 1 1/2 cups shrimp mixture. Garnish with chopped fresh parsley, if desired.